. .Round, black and rugged! The first impression of the m100 is surprising. It's different, black, soft-edged and at first sight it looks a bit like a cheap toy. But holding it for the first time makes clear, how pleasant the form factor feels in your hand. Additionally, the m100 weights with its 140 gram over 25% less than a PalmIII and the case seems slimmer. But the true overall dimensions are nearly the same, it's just the feel. You have to hold an m100 to tell. In addition, the new m100 is probably the most rugged Palm ever released. UPDATE: Meanwhile there's an 'X' version of the m100 on the market, the m105. But there are only exactly 3 differences, so I saved an extra review for the m105. The m105 has 8MB of RAM instead of 2MB. It comes with a hotsync cradle instead of a hotsync cable only and the m105 pack contains also the Mobile Internet Kit, which you have to buy seperately for the m100 if you need it. Palm finally found a very nice solution for the protective cover. Coming with a double hinge, the lid travels 180 degrees over the case all the way to the back. That's a great construction for every-day use and very convenient. The scroll and application keys are in the usual place and completely covered by the lid. The m100 cover protects the keys quite well, unless you press the lid really hard. 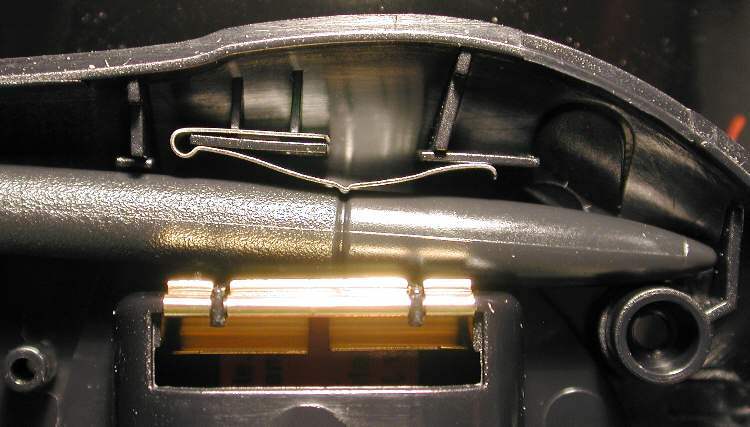 The power key moved to the top center of the unit and is also hidden very well when the cover is closed. Palm implemented a nifty little idea: The protective lid has a hole above the scroll up key and a transparent window above the upper third of the LCD (see left photo above). When the m100 is switched off, and only then, the scroll up key switches it on for about 2 seconds to show time and date through that window. Following the trend on the mobile phone market, the m100 has a snap-on faceplate. Palm offers quite a variety of colors themselves and the third-party market will surely also offer more chances to customize the m100. Probably to compete with Handspring's entry level price, there is no cradle supplied with the m100. 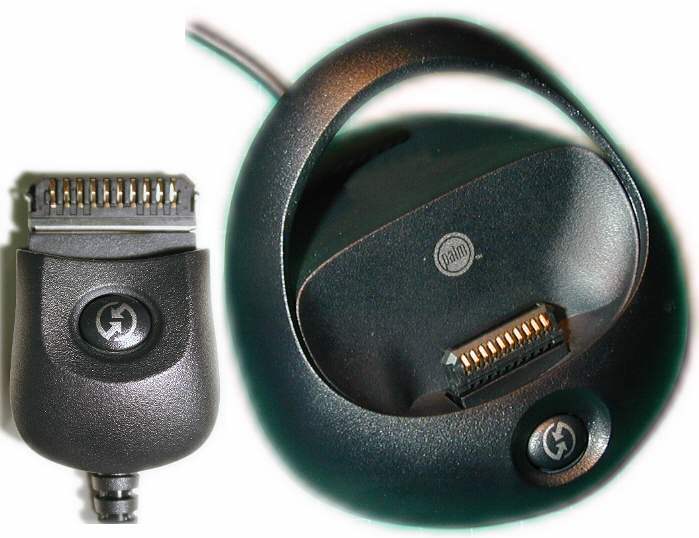 Instead Palm bundles a hotsync cable which has a hotsync key on the Palm plug side. On the road, that solution is anyway more convenient than a cradle. However, if you plan to use and sync the m100 at your desk alot, it's better to add the $29.95 for the optional cradle right away. The m100 sitting in the optional cradle, the cover can be flipped out of the way easily. The pin-out didn't change from the Palm III series (except the IIIc which has the charge power pin), but unfortunately Palm modified the physical dimensions of the plug slightly. Beeing more specific, the new m100 hotsync plug would fit in a Palm III, but it would be a bit too long which wouldn't matter much. But an old Palm III plug is a bit too short to reach the contacts in the m100. Because of the complete new case shape, the old accessories won't fit on the m100 neither. Again, electrically they would work. Let's have a look inside the m100. 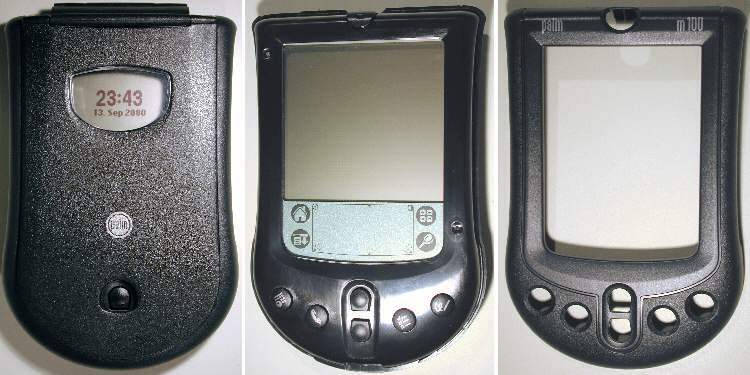 The basic electronic concept forms a typical Palm: Motorola EZ CPU clocked at 16MHz, 2MB ROM, 2MB RAM, a serial port, an IrDA port and a power management to run the unit on 2 AAA batteries. 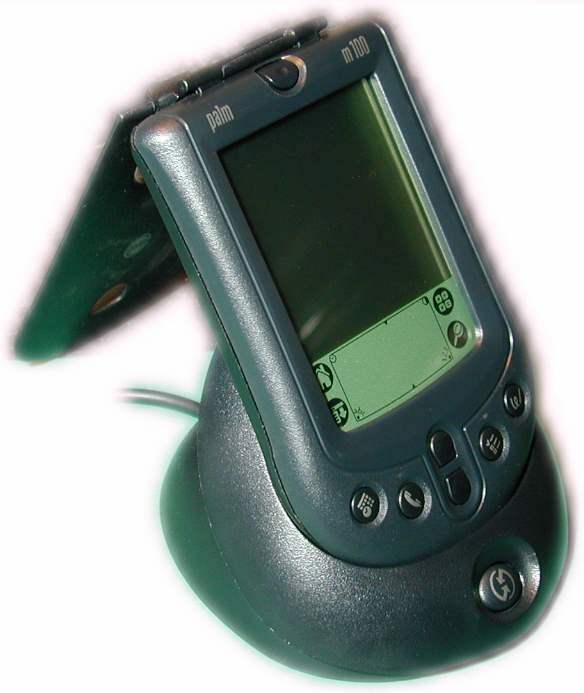 Together with the installed Palm OS version 3.5, the m100 is 100% compatible with all other Palm models. Like in the Palm IIIe, the OS comes burned in a ROM. There's no Flash in the m100 that could be updated. Without Flash the m100 also doesn't qualify for the use of tools like FlashPro. The m100 design is very cost effective. 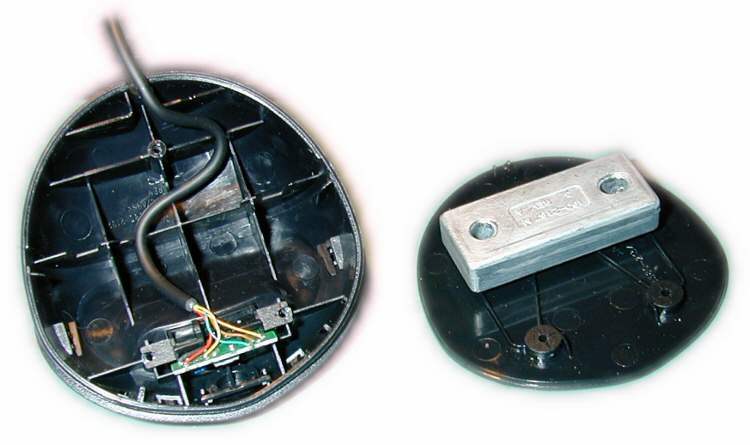 All parts are located on one side of the printed circuit board, which safes assembly costs. All the keys, including the power key, are a special, integrated construction. 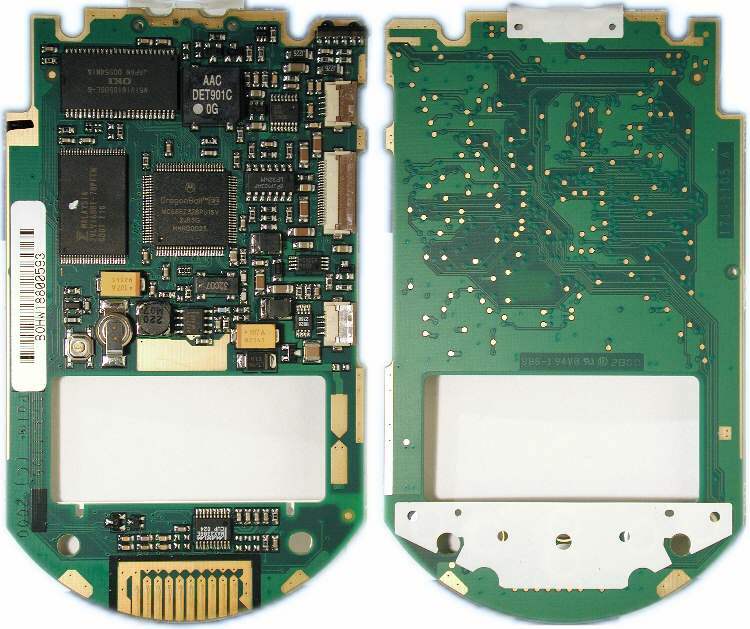 Little thin, slightly vaulted steel plates are fixed directly on the PCB with an adhesive foil. The counter contacts are integrated on the PCB itself. If the materials are all choosen carefully, such a construction can be a good solution. The feel of the keys is nice. However, the Palm IIIc was the first unit using that kind of keys and there were quite a few complaints about the lifetime. Hopefully the construction in the m100 is more durable, only time will tell. 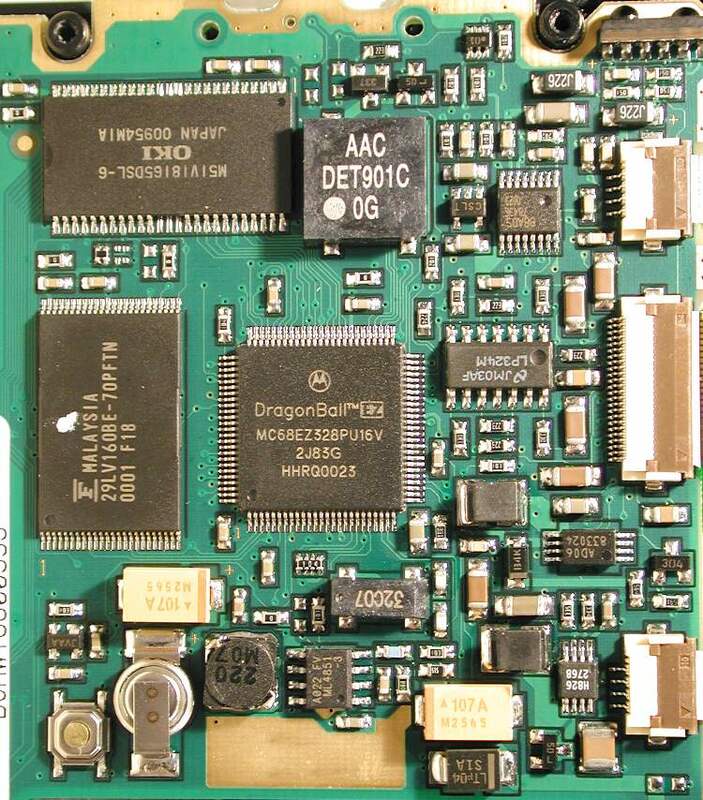 Except the serial driver, the image above shows indeed the complete electronic that is necessary to build a full working m100. The cases of the CPU, the RAM and the ROM are still quite conservative types (in the PalmV the much smaller BGA cases were partly used), but alot of the conventional parts are coming in smaller cases. Especially the coils for the switched power supply and the backlight hight voltage generation are much smaller. Broken coil edges which could be found quite often in the PalmIII are most likely history. The memory backup system, which is most likely no capacitor but a tiny Lithium Ion battery (I'm still not 100% sure about that), shrank also. But more about that in the power supply section. To answer the question right away, yes, the m100 could be upgraded to 8MB of RAM. In fact the m105 is nothing else than an upgraded m100. The problem for most users is most likely to find the right chip and an SMT equipment ... let alone the skills to desolder the chip without ruining the PCB. Better get an m105 right away! 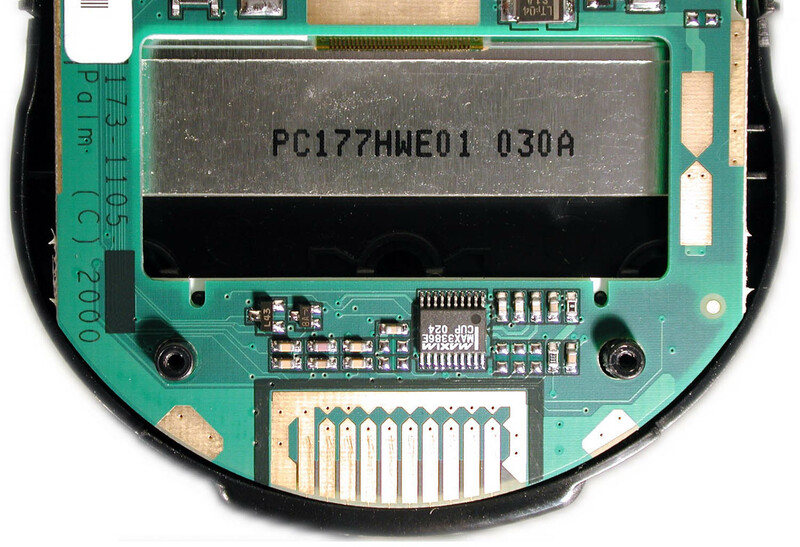 The serial port is 100% compatible to all other Palm models, the pin-out is the same as ever. But there is a long overdue improvement. The m100 uses a relatively new MAXIM driver, the MAX3386E . This chip has not only 2 input / 2 output channels as all the old drivers used in the Palm units, it has 3 output channels. That additional output channel finally allows DTR to supply also an RS-232 compliant signal level. So far, DTR only toggled between about 3 and 6V which resulted in alot of problems with some external modems for example. They just didn't accept these voltages as different RS-232 signal levels. Palm also spent the few cents more for the 'E' type of that driver. The 'E' stands for ESD protection and means, that all in- and outputs are protected against static discharge voltages of up the 15000 volt. In the table below all the signals are listed again. One of the main reasons for the reduced weight of the m100 can be found in the construction of the LCD. 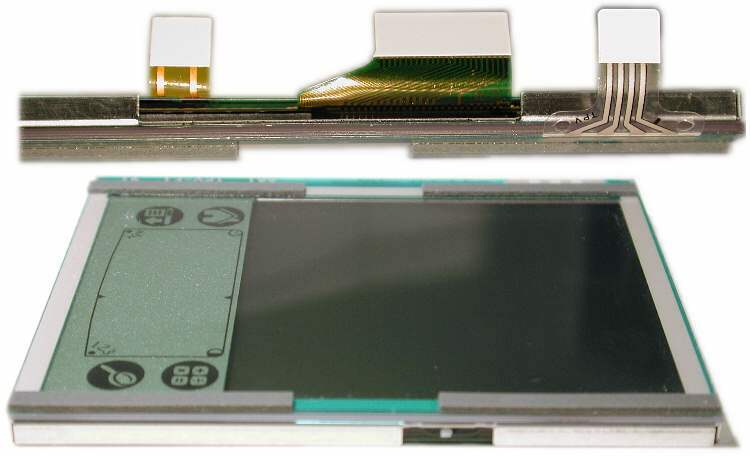 Instead of a protective glass layer, the LC-Display of the m100 makes use of a plastic sheet to seperate the actual LC layer from the digitizer foil. This transparent plastic layer not only saves some weight, but it's also alot more robust than glass. The edges of the glass sheet in the displays were the most sensitive part of all Palms so far. Even a moderate bump on these edges most always caused a crack. Additionally, the m100 display is protected with some thin foamy tape stripes between the display and the case. Although the resolution is still 160x160 pixel, the active display area is nearly 20% smaller on the m100. For the experienced Palm user, the icons appear quite small. Though, since the display is very sharp, the readability is excellent provided a good vision. The backlight works the same way as with all the monochrome Palms, except the very early models. The pixels become inverted and kind of hard to read in semi-dim ambient light. But it seems the m100 screen improved that situation a bit, since the dark pixels are not completely dark, but dark greenish. The effect is hard to describe, but overall the illumination seems to work better in a dimly lit environment. The digitizer 'feels' quite good and seems to be more sensitive. Grafitti input works very well and more error free on the m100, but that's a subjective impression. Finally we don't see the mechanical contrast wheel anymore, the m100 has like the PalmVx an electronic contrast setting. But on the m100 there's no extra key to bring up the contrast slider. Instead, you have to tap the right upper corner of the grafitti area to bring up that tool. The electronic adjustment not only eliminates the clumsy wheel, but makes the contrast also much more stable against temperatures changes. It was my assumption in earlier reviews already, that it's more the lousy variable resistor than the LCD itself that caused the sometimes dramatical contrast variations on older Palm III models. Anyway, that's history with the m100. The m100 is the most power saving Palm of all. Already in idle mode (switched on, no user activity) it consumes about 10% less energy than a Palm III. But also under full working conditions it surprisingly uses energy more sparingly. Instead of about 60mA (Palm III), it consumes only 45mA. These differences can hardly be explained, since the m100 uses the same CPU and memory. Only a higher efficient switched power supply could help to conserve some energy. But the biggest difference makes the backlight consumption of the m100. Maybe partly with the help of better converters and for sure because of the reduced display area, the m100 backlight consumes nearly 40% less current than the illumination of a Palm IIIx (about 20mA instead of 35mA). All in all the life of 2 AAA batteries should last at least 25% longer in an m100 instead of a Palm IIIx. BTW, the difference in RAM size is no real explanation. A considerable difference could only be caused by a different number of chips, not when _one_ chip has just more or less capacity. A nice new detail can also be found considering the data retension. Palm got rid of the unfortunate super-cap which caused quite some trouble in the past. People repeatedly complained about lost memory when replacing the batteries even fast. The m100 most likely uses (I'm still not 100% sure, sorry) a tiny rechargeable Lithium batterie. It's really tiny, so don't confuse it with the usual memory backup batteries which can supply the memory for days or weeks. The new one in the m100 is able to safe the data for about 10 to 15 minutes, and so it does much better than the old super-cap did. Hectical battery replacements should be history. Nevertheless, there's still that same '1-minute-warning-sticker' in the battery door of the m100. Maybe Palm needs to print new labels. Last but not least, althought the m100 was built to use 2 AAA Alkaline cells, it works perfectly with 2 rechargeable NiMH batteries. With its reduced consumption it easily reaches 15 hours continouos operation, good cells provided. It'll probably remain a secret of Palm, why they release so many different OS with the same version number 3.5. However, the m100 OS got the same version number than the one of the IIIc, the Vx or the monochrome III series, and it's again quite different from all others. The first surprise awaits the user right when he inserts the batteries for the first time. After the chance to admire the new, round Palm logo for a good while, the non-US version of the m100 offers 5 different languages to choose from. There's English, French, Italian, German and Spanish, that's why that ROM version is called the 'EFIGS' version. Picking one of these languages then is valid until the next hard reset. There's no possibility to alternate the language later. The reason for that behaviour is, that the resources are packed compressed in the ROM. They're tied into the system once only after a hard reset. BTW, the 2MB of the ROM are really stuffed. So even if the m100 had Flash instead of Read-Only memory, tools like Flash-Pro wouldn't find space to work with. Of course there are also quite some routines in the OS that needed to be adapted to the hardware and the functionality of the m100. The scroll-up key has to activate the new application 'Clock' for about 2 seconds when the unit is turned off. Then the time and date appears through the new little window in the cover. But 'Clock' is now also responsible for setting the system time and date. The former fields in the Preferences to set time and date disappeared on the m100. Additionally there is a single alarm option in clock, so for a quick reminder you don't need to use the DateBook anymore. 'Clock' seems to be that important to Palm, that they even dedicated the last free corner (left /up) of the grafitti area to 'Clock'. A tap there brings up 'Clock' for about 3 seconds. BTW, 'Clock' makes use of an extra large font for the time display that is not available in other Palms (with OS 3.5!). You can beam 'Clock' to another, older Palm, but the time doesn't display so nicely, neither works the trick with the scroll-up key. Maybe important for some network users, the two protocols SLIP and CSLIP are missing in the m100 ROM. In fact the drop down selection for the protocols is unnecessary on the m100, since there's only PPP left. But maybe other protocols can be loaded into RAM, I didn't check that. Anyway, out of the box the m100 can do only PPP. A brandnew application found its way into ROM of the m100. It's called 'Note Pad' and allows to scribble notes on the screen. The 'sheet' in Note Pad is only 1 screen wide, but about 4 screens long and it scrolls automatically down when the stylus reaches the bottom of the drawing area. Note Pad's drawing capabilies are very basic. There are 3 different line widths and an eraser tool, that's it. But with each note a single alarm can be associated and the note pops up when the alarm is due. All in all Note Pad is a cute little app that belongs to a device with touch sensitive screen anyway. Who can deny the fascination of an appearing line right where the stylus touches the screen :) ? The application Mail was thrown out of the ROM completely. It's still available on the CD that's supplied with the m100, so it can be loaded into RAM in case someone is missing it. But that's very questionable, since there are much better mail applications on the market. Most of these 3rd party apps are able to really send and receive mail with the help of the inbuilt TCP/IP stack and any kind of modem or mobile phone. Palm's Mail exchanges messages only during a hotsync with a PC based mailer. I can't figure alot of users missing the original Mail. Finally 'Expenses' was also thrown out of the ROM. Especially in Europe not much people with miss it either. It's not really a part of the new OS, but part of the supplied software for the m100, so it should be mentioned here at least. On the supplied CD you find an application 'Phone-SMS' which allows to create SMS messages and send them with certain mobile phones. I tried the application with my S25 and had no luck. I know for sure, the S25 and the Palm are communicating quite nicely together in general. I have no problems to connect to my ISP using the m100 and the IrDA link to the S25. The mobile just acts like a standard modem in that mode. But Phone SMS anyhow fails to send messages I created on the m100, although the communication is basically working. Then again, it's hard to believe that PhoneSMS is generally not working. The m100 is such a new Palm modell, especially its mechanics, that there is stuff to mention which doesn't fit any other category. I'll try to cover that here. First of all, there is the improved case regarding the stability. The image below shows the back of the case. The construction is much more 'stiff'. 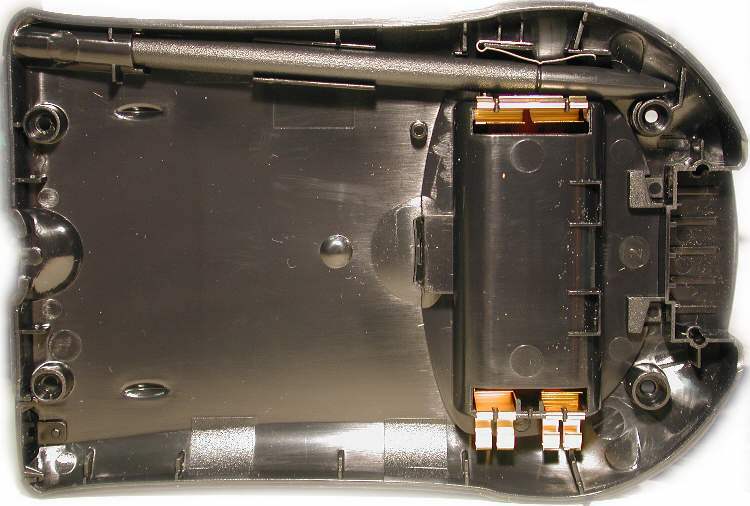 The light battery contacts used in the Palm III were replaced by much more solid, goldplated v-spring contacts. I personally found the spiral contact for the positive pole of the battery in the Palm III never a particulary lucky solution. The flat contacts in the m100 are giving a much better contact and a firm hold. The contacts are now completely preassembled in the case and they make contact with the main PCB when the m100 is closed. BTW, the m100 is held closed with 4 Torx screws, so you better get a new tool if you want to have an own look inside your m100. Nearly noble is the solution how the stylus is locked in its place. Ironically the cheapest Palm so far comes with the best solution. For once, the stylus has a better seperated space in the case. In the Palm III series, it could happen that the stylus scratched along the plastic flat cable coming from the LCD if that wasn't bend 100% right at assembly time. So the flat cable could be worn out. That problem is solved with the m100. Even better is the little metal spring that holds the stylus in place. Again on the Palm III series, the plastic 'naps' holding the stylus in place could wear out, or were too tight when the unit was new. The metal spring in the m100 gives a very smooth, definite feeling when arresting the stylus and holds it securely in place. Then again, taking the stylus out is as smooth as pushing it in. It sounds like no big deal, but high volume, low cost units like the m100 are optimized for each single cent and an additional metal part is definitely a cost factor. See the image below. Needless to mention, that no stylus from any other Palm model fits in the m100. The top of the m100 pen has a very special shape and it kind of completes the case shape when it's stowed away. Unfortunately Palm made the m100 stylus a one piece plastic part, so the reset pin is gone (maybe the cost they had to safe for the spring <g>). And especially the m100 could use a special reset pin very well, since the actual reset button sits deeper than ever. You need a very thin, at leat 10 mm long tool to reset an m100. Frankly, I never understood why Palm didn't make the reset holes big enough for the tip of a stylus. The hole would be still small enough to prevent an accidental reset. BTW, the new HandEra 330 shows how it could work. The m100 still uses the same little piezo speaker as all Palms, but in the m100 it seems to be a bit louder. That's caused most likely by the different case design. Sound sleepers still won't be able to use the m100 as a realiable alarm clock in the morning. For date book alarms the volume is ok. Conclusion - Palm had to find an entry level solution for the market. More and more people are discovering the PDA as an interesting tool, but they aren't 100% sure how useful it is for them. These customers are not willing to spend $300 or more for a cigarette box sized tool. The $129 (listprice) of the m100 are more likely to be spent for a first experience (and meanwhile the price is most likely even more down). At the same time, these users must not be disappointed with cheap 'copies' of real PDAs. The m100 is 100% compatible with the Palm platform and there's no application for the expensive models that wouldn't run on an m100 (except perhaps some color enabled games for the IIIc and the m505). The 2MB RAM are fine under Palm OS, they offer plenty of room for 3rd party apps, let alone personal data like phone numbers or date book entries. The slightly smaller screen might be the biggest drawback, although newcomers might not even realize it that much as experienced Palm users. The design is very special, but nevertheless quite 'trendy' and it'll find its friends. And quite frankly, the Palm III series cases weren't particular beauties either. But despite the low price, there are also clear improvements coming with the m100. The construction is much more rugged, the protective cover is working very well. The power consumption is even better than the one of any other Palm model. In one word: It was never cheaper to get a real good PDA! If you don't go for it now, you're probably not yet ready for a PDA :). 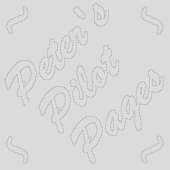 Copyright © 1997-2001 by Peter Strobel, all rights reserved.